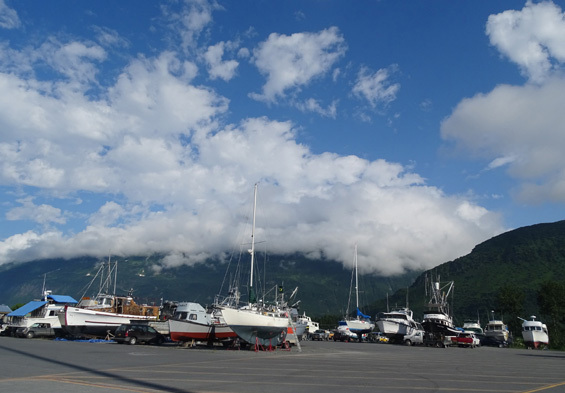 "Valdez was established in 1897-98 as a port of entry for gold seekers for the Klondike goldfields. 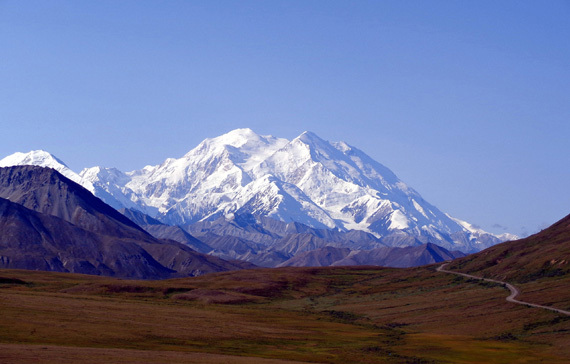 where early stampeders faced dangerous crevasses, snowblindness, and exhaustion." This summer we're playing much of our itinerary "by ear," with very few campground reservations. That gives us more flexibility to maximize good weather conditions and opportunities to be outside hiking, cycling, and sight-seeing -- and to move somewhere else if it's going to rain for a while! After Jim decided not to ride the Kluane to Chilkat International bike race we left Haines a week earlier than originally planned. 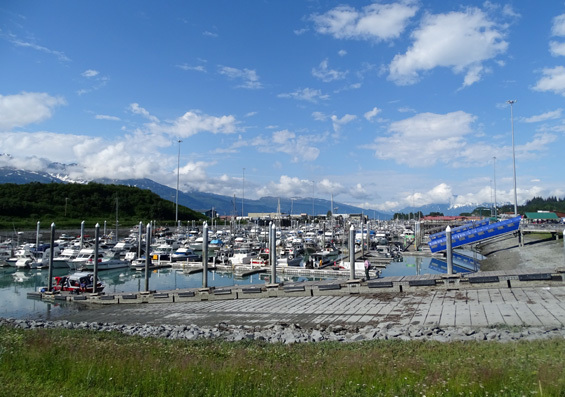 That gave us more time to visit Valdez, a town we enjoyed when we were here three years ago. This mural on a brick wall in town illustrates Valdez's role in the Klondike Gold Rush. The weather determined how long we're here. Since it has been warmer and more sunny than the last time we were here, we're staying five days before moving on. 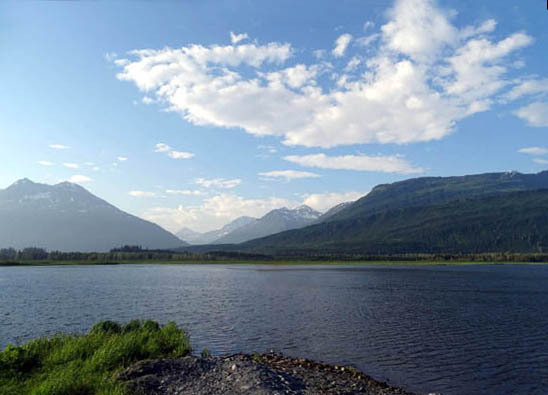 This entry focuses on the campground and nearby Valdez Glacier Lake and Robe Lake. 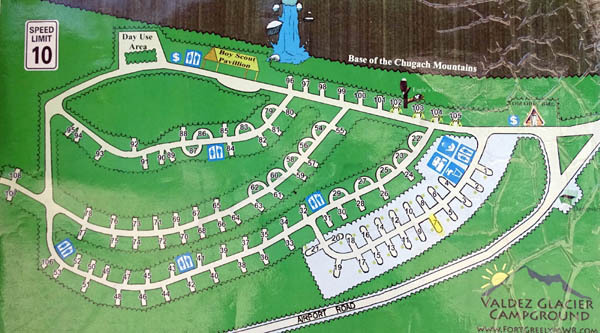 This large, heavily forested campground is run by the Army (Fort Greeley) but is open to the public. The military rate is $5 less per night than the civilian rate. 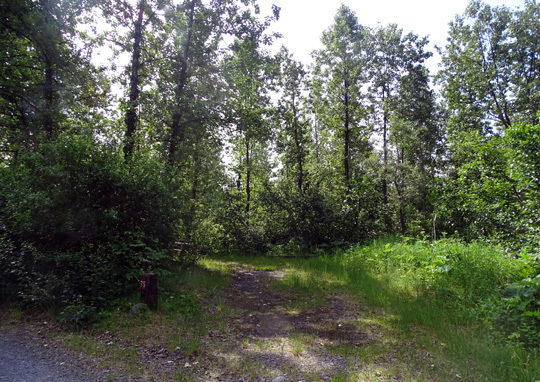 The campground is on located about three miles out Airport Road, which intersects with the Richardson Hwy. three miles north of town = six miles to town from the campground. When we were here three years ago for three nights the twenty sites with electricity were only half full. All of them are back-ins along the side road closest to the entrance. We can fit into the majority of them but not most of the remaining 80+ pull-thru and back-in sites that are more wooded and off more narrow roadways. Those sites are small, very rustic, and have no hookups at all. I marked our site (on the right) in yellow. The twenty sites with 30- or 50-amp electricity do not have water or sewer. Six of them have rental trailers on them that are often occupied on weekends. That leaves just fourteen sites with electricity left for visitors with their own RVs. Potable water and a dump station are located near the entrance. Since no one can make reservations to camp here, we arrived on a weekday when more electric sites were likely to be available. We were hoping to get the large, secluded site we had three years ago. We like this relatively large site. 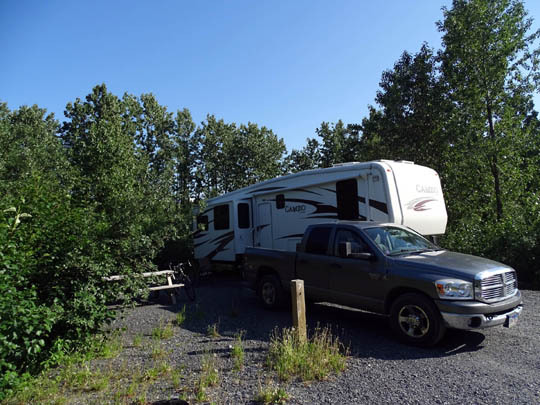 It has thick shrubs and trees on either side and the back for privacy, it is oriented well to the sun and mountain views, and it's fairly close to the campground entrance. We wanted just 30 amps at the $25/night military rate ($30 for the general public). This is a 30 + 50-amp site. The campground host said if we hook up to the 30 amps we could pay $25/night instead of $30/night military rate for 50 amps. If we needed to hook up to 50 amps for some reason, we had that option for an additional $5 (we didn't need it). The Verizon phone signal is weak at our site but we're able to make most phone calls and get on the internet OK with our personal MiFi. 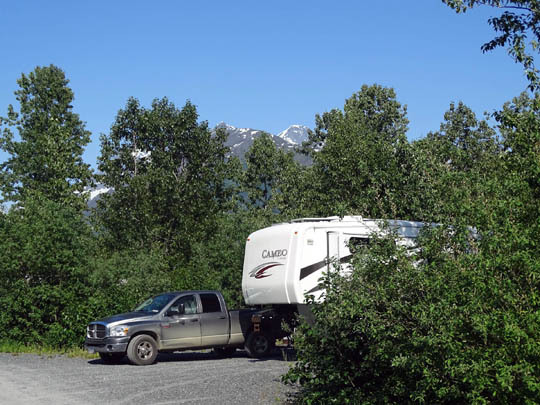 The camper and truck were dirty from the drive from Haines -- a common problem for visitors driving through Alaska or northwest Canada. Jim filled the water tank on the way into the campground and he was able to rig up the hose to wash the camper with minimal water from our tank. He washed the truck in town. It got dirty again pretty fast, even on paved roads. It's lush green everywhere but, like the rest of Alaska, this area hasn't received as much rain as usual. The gravel roads are very dusty, including the ones in the campground, and work trucks hauling rocks and sand to town for a major construction project keep the roads pretty dirty. By the weekend all the RV sites with electricity were full but there were only about a dozen no-hookup camper and tent sites occupied. Rachel and Spencer have been full-time RVers for three years, which is unusual for a couple so young (I'd guess late 20s). They have a business they conduct online. They often boondock to save on travel costs but an internet connection is critical for their business. 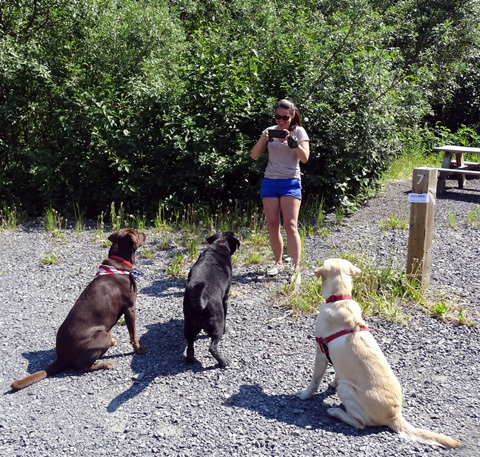 They're spending the summer in Alaska and have already explored much of North America. Sometimes I wish I'd done something like that at an earlier age but Jim and I didn't even know about the lifestyle until after we'd retired. Better late than never! Soon after getting set up in our campsite we started exploring the area and getting reacquainted with the town of Valdez. Two of the first places we visited were nearby lakes, in hopes of finding some new trails to hike. This scenic lake is popular for fishing but I didn't see any trailheads. It would be fun to hike all around the lake. I haven't found any trails around the lake at the end of Airport Road, either, just a big jumble of boulders. Our campground is about three miles back Airport Road. 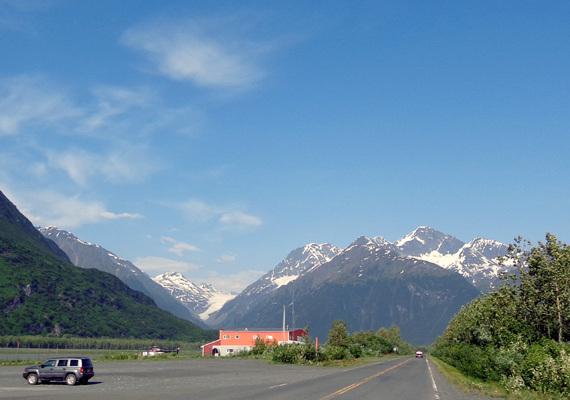 The road dead-ends in another couple miles at the lake formed by melting glaciers in the Chugach Mountains to the west and north of Valdez, including large Valdez Glacier. 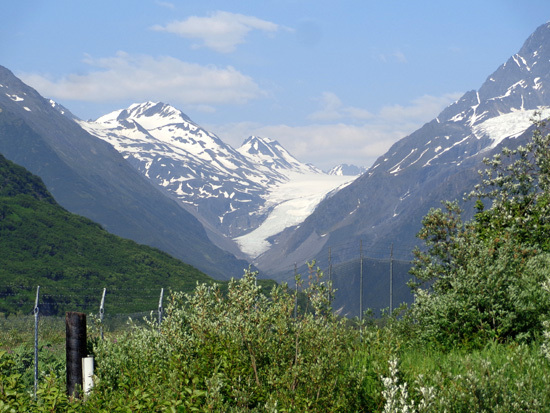 This glacier played a key role in the establishment of the town in the late 1890s. 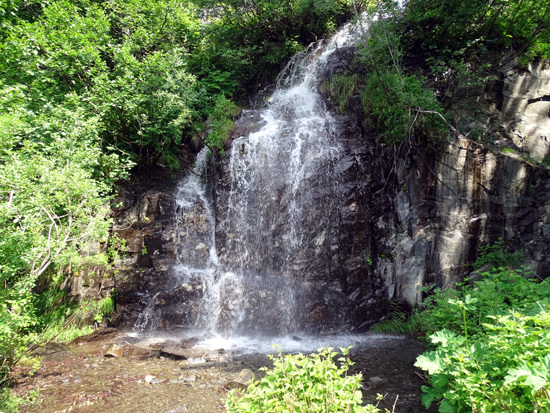 Valdez became a port of entry for gold seekers headed to the Klondike gold fields near Dawson City. 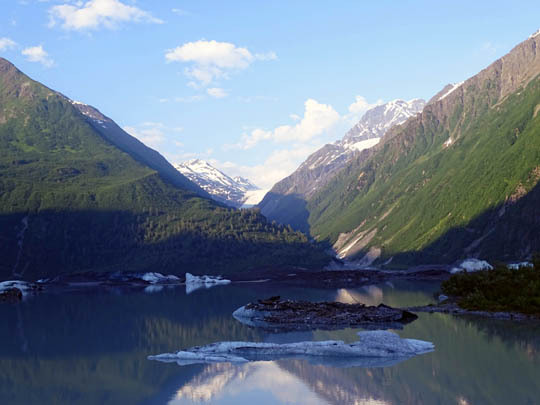 The original All American Route took thousands of optimistic stampeders up and over Valdez Glacier, a very dangerous route with deep, unseen crevasses and other perils. The trail was later rerouted through Thompson Pass. The pass gets more snow than just about anywhere else on earth but at least it's not a glacier. Glaciated area at the end of Airport Rd. 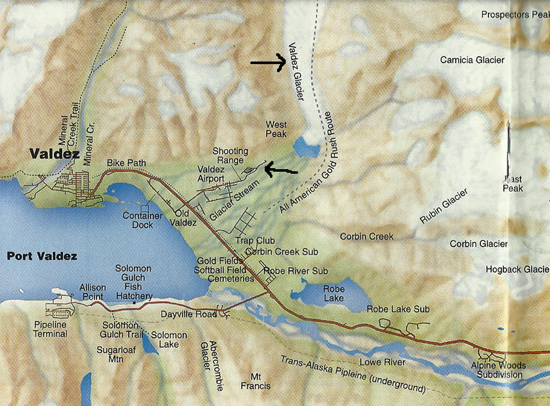 ; our campground is between the airport and the glacial lake. Today Valdez Glacier has retreated far enough that you can't see it unless you either scramble half a mile through large boulders or fly over it. Our campground is about two miles from this lake. On the first day we heard some very loud blasts emanating from this area. 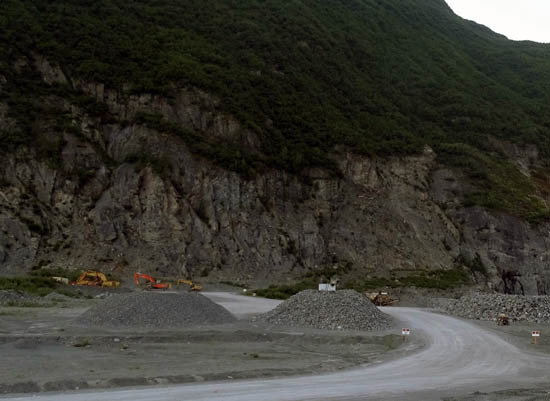 The campground host advised us that many tons of rock are being blasted from a mountainside near the lake to use in Valdez harbor, which is being expanded to accommodate more boats. Fortunately for us, the large trucks hauling it out use another road along the river to reach the main highway into town, not Airport Rd. 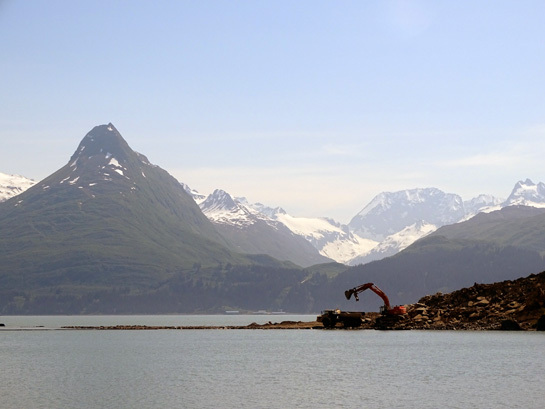 All this work currently makes the northern half of Valdez a mess. Big trucks are constantly hauling rocks to the site and going back up the Richardson Hwy. for more. Even though they don't use Airport Rd., we have to deal with the noise, dust, and mud on the main highway and in town every time we go in. We're glad we aren't in a couple of the campgrounds right next to their route. On the other hand, the visitors in those RV parks don't have to listen to the blasting like we do at Valdez Glacier CG. Each blast of dynamite also vibrates our camper a little bit. In addition, the small planes going into and out of the nearby airport, plus a shooting range on the other side of our campground, make this a noisy place to camp. 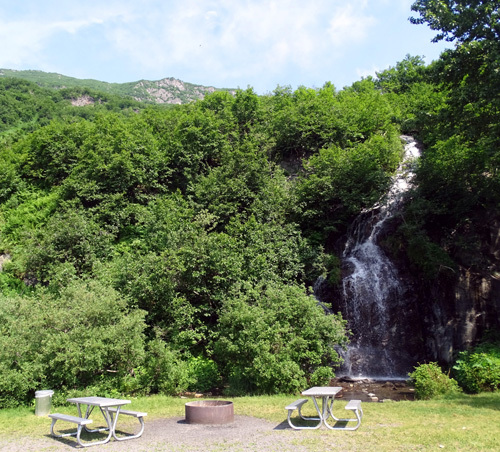 Above and below: A pretty waterfall in our campground offers some respite from the noise. On the positive side, we're usually gone during the day and it's quiet at night. 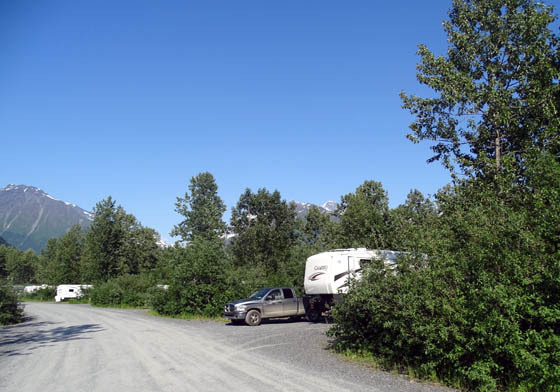 Compared to the other RV parks in and out of Valdez this is the most reasonably priced for us (military rate) and has the most spacious sites. I bet the other campgrounds in town don't have their own bald eagle nests, either! The eagles are fun to watch. We initially paid for three nights but ended up staying for five because the weather was good and we found plenty of things to do. I'll talk about our activities in subsequent entries.